Back at CES 2018, AMD only teased the future of Radeon RX Vega graphics, but at Computex 2018 the chipmaker further detailed what we can expect from its next generation of GPUs. 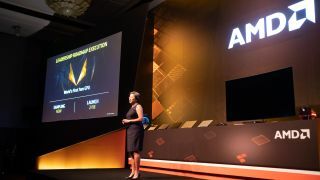 While you might be hoping for some mainstream GPU news, AMD actually showed off its next-generation 7nm Radeon Instinct chip meant for deep-learning applications. That said, the Radeon Instinct 7nm still looks very exciting, as it packs a whopping 32 GB HBM2 video memory. According to AMD, the miniaturized process brings a 35% performance boost over last-generation 14nm nodes. At the same time power efficiency has been doubled, so the chip can theoretically do the same amount of work with half the wattage. Ultimately, all the work being done on 7nm Radeon Instinct graphics will trickle down to improve the forthcoming generation of 7nm Radeon Vega GPUs. AMD’s 7nm Radeon Instinct GPU is already in the sampling stage right now, and the company expects it to launch in the second half of this year.